My first day at school didn’t get off to the greatest start. I woke up nice and early, showered and got dressed. I can now wear trousers to work (my previous school, like many in Thailand, insisted that all women wear skirts because it is basically still the 1950s here at times) but this just meant that I felt a bit weird in my new school outfit. I hate being late so as usual, I was ready far too early and arrived at the school before anyone. But there was something really strange – there was no one there. Absolute ghost town on campus. I am a worrier, and being early to things only gives me more time to worry about things. After waiting for 20 minutes it was 8am – the time that I was supposed to be meeting someone for my induction – and still no one had appeared. I decided to have a wonder around and found the school office… which was unoccupied, pitch black and locked. Great. It didn’t take much nosing around to see a memo on the staff notice board reminding people that Monday 10th March would be a day off for everyone. Fantastic! My new school had completely forgotten about me and hadn’t told me that my first day would actually be on the Tuesday. Being the worrier that I am, this started conjuring up all sorts of feelings and set my mind off on a worrisome tangent that didn’t instill any confidence in my new employer in me. By 8.30am it was clear that the only people coming to school were the dozens of Burmese builders who kept passing me and looking at me confused as I stood basically in a business suit squinting through a locked office door nosing at the staff notice board. Defeated, I called T to ask him to pick me up. It was of course sod’s law that as soon as he arrived to collect me, I would get a confused phone call from someone from my school asking where I was. Turns out that although my original meeting was supposed to be at the office I was waiting at, it should have been moved to the actual campus that I will be working at. So I was standing outside a locked office at the wrong bloody school! Luckily it was only a short walk away and I was at the international school campus ready to start my induction, albeit an hour late. Did I mention that I hate being late? So by now I was stressed out about being late, still dealing with latent worries about my school forgetting about me, and was hot and sticky after being outside for an hour waiting at the wrong door. Like I said, not the greatest start to my first day at school! Luckily, my non-start to my first day wasn’t a precursor for things to come – after that it was all plain sailing and smiles. I’ve got a lot to get my head around as it is so completely different to the job I’ve been doing for the past 18 months, but so far I am really enjoying going with the flow and figuring it all out. The teacher I am supposed to be working with has gone on maternity leave and her replacement is also as new as I am so we are both forging our way through it together. In a way it would have been good to have the actual teacher there but it is also good that we are both brand new as we can make our own routine and do things how we like, even if that means winging it every now and then! Liars. Cheaters. For many people these words conjure up images of sneaky, dishonest people. So how is it that the wonderful people of the Land of Smiles can be associated with them so? 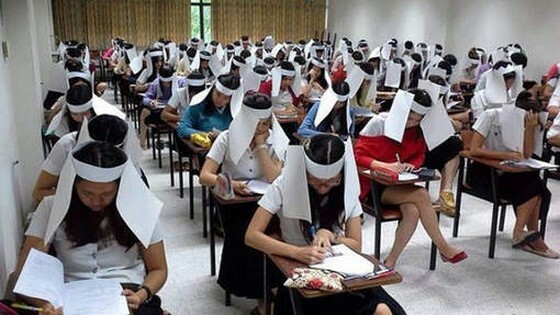 Anyone who has spent any time working within the education system in Thailand will have seen some evidence of cheating. Copied tests (sometimes, even PHOTOcopied which is amazingly blatant), completed notebooks handed around the classroom, plagarised work unashamedly stolen from the internet. I have been handed work that has been hand copied, beautifully, but when you read through it it is 100% plagarism, through and through. They go so far as to copy the footnotes, links and references that don’t need to be there. I’ve had pieces of writing with, “Click here to see our article on global warming”. Clear evidence that it was not only taken from the internet but also that the student hadn’t even taken the time to read through it – or did, and didn’t understand. The best students are the ones that aren’t even clever about it. If you’re going to try and cheat, at least try and put some thought into it. If you are going to copy your best friend, don’t copy it word for word, or even better, trace it. Teachers have a keen eye and can not only spot a copied piece of work but can usually identify the original piece. I’ve had a whole class hand in work with around 70% all copied from one student, including her mistakes… dexciping is not a word and it is very unlikely that three quarters of a class all individually dreamed it up. Another time a ‘personal postcard’ turned into a copy cat drama when all of the students turned in the same piece of work. Images like this one have been doing the rounds on the internet. Anti-cheating hats in a university exam. Yesterday this article appeared on Coconuts Bangkok, by Joel Gershon; a lecturer at a university in Bangkok who carried out a survey of his students looking at their opinions on cheating – yes, it still goes on even at university level. According to his article cheating is widespread and little is done about it. …let’s understand that we cheat and lie for a good cause. It’s a matter of cultural perception. We lie because it’s polite. Our social norm is based on “face value”. We must give face, even if it means lying. To lose face is a great embarrassment. So once again, the concept of losing face supersedes all. As a teacher, it is difficult to be part of a system that allows cheating, especially when it is denied and a blind eye is turned. All that we can do is try to encourage students to do their own work and praise them when they do. I try my best to spot the copied work and hand it back to students, asking for an orginal piece – it confuses them, but hopefully eventually they will realise that I would rather see an OK piece of work written by the actual student than a perfectly copied piece of someone else’s writing. I swear if I didn’t have to write the date on the board I would have no idea that it is June already. Time is flying super-fast, I’m in my fourth week of teaching this term and so far the students are up to date with what is in my plan (yes, I have a plan. I have developed the ability to be organised, and the anxiety associated with not being organised – a changed woman indeed!). Looking at the list I realised something; the a vast majority of it is completely irrelevant to my students; they won’t have the task of going through the definition of each word and finding the most appropriate description for themselves. An overwhelming amount of my students, probably 95%, are carbon copies of one another. Black, shoulder length hair for girls or a military-style short back and sides for boys; very dark brown eyes (OK, so the genetic tendencies of an ethnicity can’t be helped), no piercings; no deviation from the norm. This ‘norm’ that the majority of students conform to is not governed by fashion, or any passing trend. It is a government issue standard of appearance that all students in attendance at a standard school must adhere to. The 5% of students that don’t conform will have attended a private school at some point and so are allowed to keep their longer hairstyle. I went to school in the UK, where uniforms and a dress code are in place. My school was probably on the more relaxed side, with a baggy maroon jumper, black trousers and the introduction of a black shoes only rule when the new head teacher Mrs. Critchley took over. Earrings and make up were not wanted but this was not policed. Similarly, hair dye was not allowed but I managed to have my hair all sorts of shades from hues of purple and red to orange and blue-black without any teachers batting an eye. During a certain regrettable gothic stage I was able to wear thick black eyeliner, purple lipstick and a studded dog collar without raising any concern. 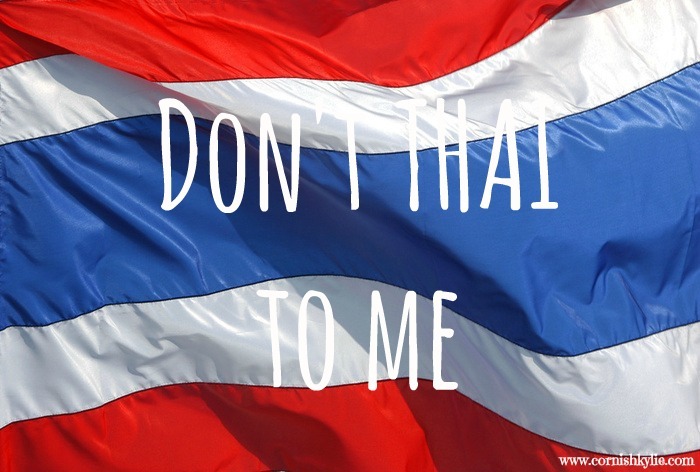 The situation in Thailand couldn’t be any further than my experience. Your socks aren’t pulled up? Hair longer than the three-inches-past-the-earlobe rule? Fingernails too long? You could be facing the cane, (corporal punishment may be against the law but is still common practice in many schools) or a physical punishment such as carrying bricks across the school campus or cleaning. These details are scrutinised during morning assembly with too-long nails or hair immediately addressed. During my first week of teaching back in October I can remember a certain spot where there would often be a pile of hair cuttings from a rudimentary hair shearing session. At the time I thought it was rebellious girls chopping off their pony tails but I couldn’t be further from the reality of the situation. Class Captain: (always sat at the front, always keen, always on time) Please stand up! Teacher: Good Morning everybody. How are you? Class: I’m fine thank you, and you? Teacher: I’m great thank you. Please sit down. This whole thing is carried out in a robotic, monotonous fashion. I’ve done away with the whole standing up thing, and prefer to simply greet the students as they walk into the room and ask a few of them “How are you?” randomly, encouraging them to NOT say ‘fine’. So many students automatically reply with “I’m fine thank you, and you?” without giving any thought to how they actually feel or understanding what they are saying. It’s just another example of how they have rote speech drilled into their brains rather than being encouraged to think for themselves. Dialogues are memorised rather than exploring the meaning of words. One student in a school near Bangkok has had some success starting a Facebook campaign Thailand Educational Revolution Alliance calling for the end of this ‘mechanistic’ education system. He has even spoken out on TV and has had some support from politicians who claim that they are considering loosening the constraints on individuality within the Thai classroom, starting with a call to relax the rule on hair length that was made last term. Despite working in a government school, we haven’t heard a peep of this – maybe because we are so far south, or because our school management don’t want to make any changes, lest they encourage students to act out and go all crazy; who knows, they may even want to wear black socks! Click here to watch a video on New York Times online about the Thailand Educational Revolution Alliance challenging conformity in Thai schools.